You are here: Home / Affiliate Marketing / Is Affiliate Marketing a Good Way to Make Money Online? I have been blogging for 2 years now and my main online income comes from affiliate programs. So I feel it’s time to address the doubts and demystify some perception people have about this industry, from my personal view. 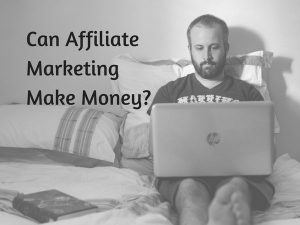 Is affiliate marketing a good way to make money online? This question is not the easiest to answer, but I’ll try to make it as simple as possible for you to understand. Let’s break down the question into 2 parts; ‘affiliate marketing’ and ‘make money online’. Affiliate marketing is a legitimate business model where company/brands pay commissions to marketers to promote their products/services. A qualified sale can yield between 3% to 70% in profit range with potential recurring values. This technique is becoming so popular that many industries are starting to employ them. You are positioning yourself within trends that are in hot demand so clearly, there are a lot of interesting niches to be tapped. I am pretty sure there’s at least one product category in the chart above that interest you. The question is, how are you going to profit from your chosen niche. Here’s where the second part comes in. Making money online is a job that has everyone scouring the internet and ended up being scammed. I’ve been a victim myself so I know very well how these offers look like. If you need to fork out hundred of dollars on something that you are not sure/never heard of, chances are you are dealing with an online scam. In affiliate marketing, you invest in a domain, website hosting and online training to get a business up and running. You generate income from sales commissions, instead of getting paid doing other people’s tasks. The good news is, the search engine is affiliate businesses’ strongest ally. The more you understand how people search and buy things on the internet, the more you’ll be able to convert traffic into sales. Google is a great place for affiliate marketers to thrive and as long as you have a good quality website, they will rank and promote your business to the world. It’s the scammy ones that they are trying to eliminate from the search results because these types of products offer no values to online users. So rest assured that you are not breaking any rules by doing affiliate marketing. Now that you know the potential and prospects, let me explain three reasons why this is such a great revenue model for beginners. Because you are not the creator/manufacturer, you don’t need to maintain an inventory. Your only cost of operation would come from domain registration and website hosting which you might pay between $40 to $60 per month. In other words, if you could cut down eating out on weekends, you do have the budget to get started. When you read my blog, you might have the impression that I am from a techie background. The truth is, I didn’t know anything about website or internet marketing until two years ago. However, web technology has made it possible to create a WordPress website within a few minutes and that’s how I did it. Heck, you don’t even need a license to get involved in this business. That means – college students, part timers, baby boomers – basically anyone can do this. This is truly the type of job that you can start from home and bring it wherever you go. There are affiliate programs for almost anything these days. Many of the items around your home and at work can be bought online and there’s a good chance that affiliate marketing is driving a large percentage of those sales. When you are just starting out, selecting the right niche is often tricky at first since there are so many to choose from. That’s where most people stumble, but with a bit of research and guidance, you should be able to find something that you can explore and continue to make profit for the long term. To get some inspiration, take a tour around the Amazon marketplace (they offer an affiliate program too) and see if you can find a product that can lead to your desired business niche. One of the biggest problems with employment is that people do not have enough marketing skills to pursue what they are actually good at. They learn to sell/serve their companies, but not for themselves. That’s why so many people don’t know how to break away from their 9 to 5 jobs. When you become an affiliate marketer, this opportunity will ‘force you’ to learn marketing because the earning pretty much depends on your creativity and capability to think outside of your comfort zone. Soon, you’ll discover that it isn’t really about the selling; it’s about understanding people’s problems/needs and helping them find solutions through the knowledge that you have. This skill can make you achieve a lot of things so I highly encourage that you go out there and acquire it. Back in 2014, I had a strong desire to improve my financial situation and like everyone else, I turned to the internet, hoping to look for a quick solution. Obviously, there was none and the only viable option that seems to agree with my limited experience is affiliate marketing. You see, there’s a system to how affiliate marketing works and once you understand the process, everything becomes more transparent and making money online becomes less an illusion. What I want to say is that, building a successful online business takes time, especially on the internet space where things aren’t always black and white these days. However, if you are willing to commit what it takes, affiliate marketing can open doors of opportunity and potentially change your future in ways you never thought possible. If this type of business idea appeals to you, find out how you can get started with some good training here at Wealthy Affiliate. Have any thoughts or questions about this topic? Just leave your comments below and I’ll get back to you. I have been trying to break into the affiliate marketing income stream for about a year, but I still have not had any success. I like the sound of the training at Wealthy Affiliate. Seems like a piece to the puzzle I could stand to investigate. Can you tell me a little about their service and support? I am going to need a lot of help here. I totally understand you Brendon. Just so you know, I didn’t earn anything until 1 1/2 years later. Things can be very slow initially when your site is new, hence less keywords for indexing and ranking. If you can dish out a lot of content (meaning blog posts, comments and social posting), you’ll start to see some SEO traction. From this point onward, traffic should be converting. There are many aspects that could be preventing you from breaking into the affiliate income but I may need a link to your site to investigate. If you can contact me from within WA, I can provide you some insights. I always wondered about online marketing whether or not it’s a scam or whether it’s legit. Some of these websites claim that you can make thousands of dollars in very short period of time. I’ve yet find a to find an online business where you can make money. I’ve spent more money trying to make money. I’m always willing to try something new. Affiliate marketing sounds interesting. Setting up a domain name, selecting a publishing platform, & finding a niche plus blogging sounds like quite a challenge. Wealthy Affiliate looks interesting but whether or not you can make money is the question. Are people making money using Wealthy Affiliate? Finding a domain, setting up a WordPress site and blogging are just some of the fundamentals of making money online. One needs to acquire this skill before moving on to the next step. Are people making money with WA? Yes, and I am one of them. The snapshot shown above is what I’ve been earning through WA’s affiliate program in the past few months. This year’s profit is more than the previous one because I am more committed to my blog. It’s not sufficient to allow me to work full time from home just yet, but with every effort, I am getting there. If you are still struggling with domain, niche or WordPress, just let me know and we’ll see what we can do about it. I have tried to tell my kids to not invest in their education unless it leads to a job. If I could go back in time, I would further tell them to wait and try and figure out what you want to really do with your life and try and find some time freedom. College debt is crushing and then you are a slave to all that debt. I totally agree with the affiliate marketing model being the best way to create that time freedom and to make money. I hate to hear about them already hating their jobs at such a young age. At least try something different to build a future without a boss. Why not, Pete? Sports and outdoors come second just right after the fashion category. That’s an interesting niche combination to explore. You have done a great job explaining affiliate marketing and how it works. I had no idea that fashion was the most popular. I always thought it was computers and electronics. However, I do feel that you can choose anything for your niche and be successful with it if you learn the method. You said you started in 2014, how did you do it? Yes, of course you can choose any niche – granted there’s are keyword searches for it. The chart above just goes to show the diversity of products that one can be affiliated with. My journey as an online entrepreneur stemmed from my desire to achieve time freedom. That lead me to a training platform called Wealthy Affiliate University that teaches everything from building websites to getting traffic. You can read my personal review here if you wish to be part of this awesome community. Cathy, thanks for this post as it comes at the right time for me. I started my affiliate marketing journey about 2 months ago and I am working hard to balance a successful sales career with getting in the work on my online business dreams. I have a lot to learn, but the common theme among legit websites, training, etc. seems to be quality content, would you agree? Also, is there a certain book or anything you would recommend to someone like me looking to learn and sharpen online marketing skills? Thanks. Hey Scott, I was like you back in 2014, trying to find balance between a professional job while trying to become a full fledged affiliate marketer. I went through a lot of books and blogs of other successful people, but soon realized that it’s impossible to ‘consume’ it all without overwhelming myself. So as far as marketing knowledge is concerned, I would suggest that you start with topics that you don’t know/confuse about, dig more into them and you’ll eventually find a book/resource that will suit your need. And yes, if you are talking about laying a solid foundation, good quality content paired with targeted keywords is crucial. That means a lot of research, implementing your knowledge about a certain niche and write frequently. Thanks for explaining affiliate marketing to us. Although I have been busy with this type of business model for a while, I still learned something new here. 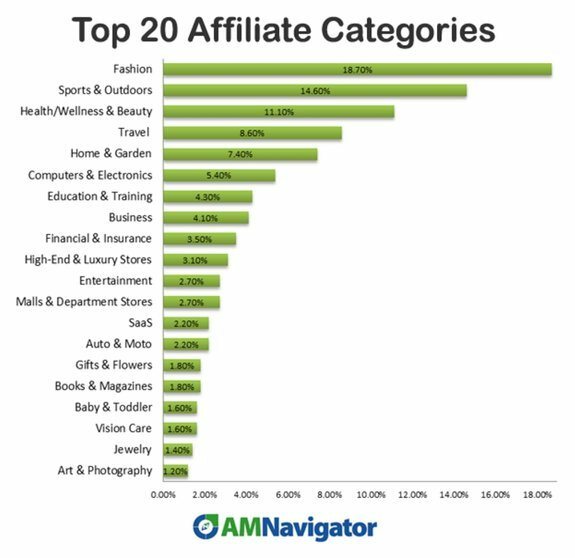 A really interesting graph over the business segments that have started using affiliate programs as a way of promoting their products. So basically you are best promoting something within the fashion Industry? Or can I promote literally (almost) anything? Hi Steven, I think the fashion industry tops the chart because fashion items are easier to source, list and ship to customers. But that doesn’t mean that other niches aren’t worth promoting. I prefer to gauge opportunities based on the keyword levels – not the niche per se – because that’s what reflects the consumer intent (demand) and your competitors (supply). I really like your article. And you’re right – affiliate marketing DOES work. I have just started earning my first commisions now and I couldn’t be happier. There’s no better feeling than earning money from your home using nothing but your unique skills and time. Your post have given me a good idea about affiliate marketing, the minimum cost I need to have like website and hosting. I think it’s a good part-time to start for beginners because of the low risk as it delivers the concept of doing business online which can potentially lead to bigger ventures that anyone desires.